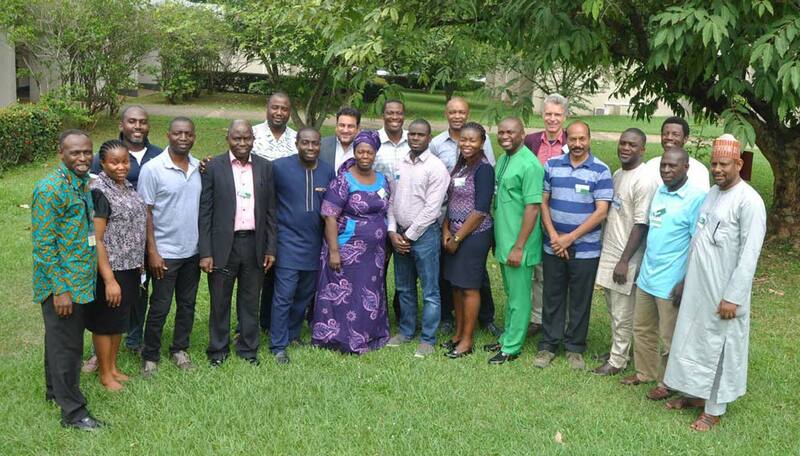 Representatives of private sector organizations, government, NGOs, and research institutions met 5–6 April at the IITA Ibadan campus, to discuss ways to enhance opportunities to see High Quality Cassava Peels (HQCP) processed and used at scale in Nigeria. They had a shared interest in this because of potential positive effects it would have on the environment, on business opportunities, on livelihoods of small-scale processors, and on the availability of animal feed. Small group exercise: drawing a rich picture. 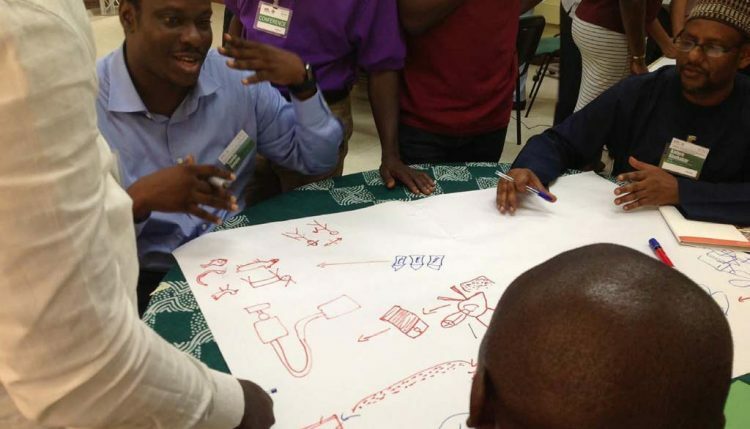 The workshop aimed to build relationships and understanding of how participants connect to the workshop topic as well as develop a shared understanding about the situational characteristics of wet cassava peels transformation and use. It also aimed to develop a shared vision for how change can happen towards wet cassava peels transformation to enable use at scale. Another goal of the workshop was to agree on ways of collaborating on research on wet cassava peels and high quality cassava peel mashes used at scale. While welcoming all participants to the meeting, IITA Cassava Breeder and Geneticist, Peter Kulakow noted that it struck him how quiet the room was when participants were there to talk about the future of 15–20% of the entire cassava crop. He said the focus of the meeting was to emphasize how to turn cassava peels into a useful product instead of just throwing them away as waste. He also said he was optimistic that the momentum was already building for this developing industry in Nigeria and probably the rest of Africa. Okike’s presentation detailed some of the problems associated with cassava peels, the production costs of transforming them to animal feed, the competitiveness versus maize in energy content, and the implications of scaling the innovation. He showcased the scaling progress made so far and the obstacles facing scaling of the innovation, while also highlighting a scaling strategy as well as key partners for scaling. Participants were given a brief tour of the production facility of the International Livestock Research Institute (ILRI), where they saw first-hand how the grating of cassava peels was carried out and how to sun-dry the de-watered mash. They were shown the “toaster” for circumventing sun-drying, and the drainage/soak away system before being shown the final bagged products which were checked for proper dryness. 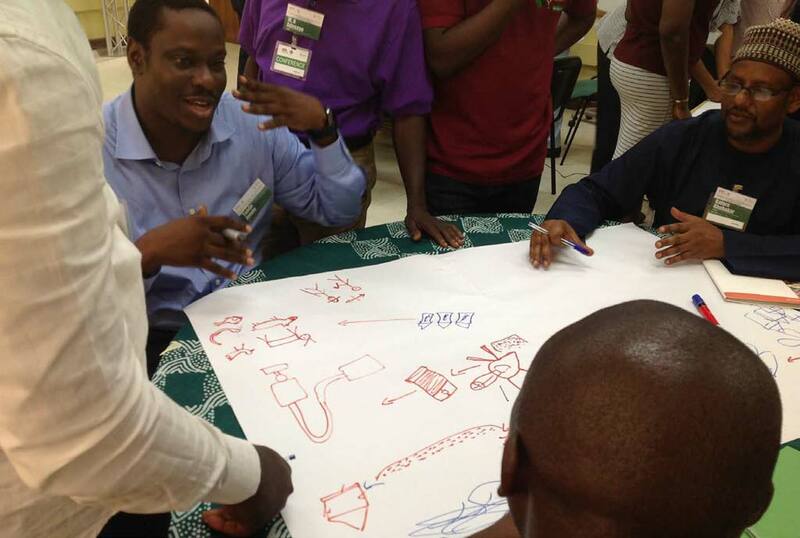 Other workshop activities included the development of ‘rich pictures’ showcasing both the current state and the possibilities offered by cassava peel usage; the capturing of initial ideas on key opportunities and challenges facing the cassava peel innovation; and the interactive building of a shared vision of how processing and use of high quality cassava peel mashes at scale could happen. Theory of Scaling workshop participants. The HQCP transformation project turns cassava peels into high quality animal feed ingredients that can be substituted for 15–60% of the maize in livestock or fish feed. It was among three projects selected for implementation under the RTB Scaling Fund for 2018/2019 with the Theory of Scaling (ToS) workshop being one of the initial activities. The RTB Scaling Fund is a mechanism created by RTB dedicated to improving livelihoods at scale to achieve the greatest possible impact.